A statement shoe is something that should be in every woman's closet. They take any outfit from a 1 to a 10. You can wear something simple and chic it up with a simple slip-on, of some fabulous footwear. That's why I am SO excited about the print trend for spring and summer. From animal to floral there are some amazing options right now. Check out 10 FIERCE finds up to size 14 below. 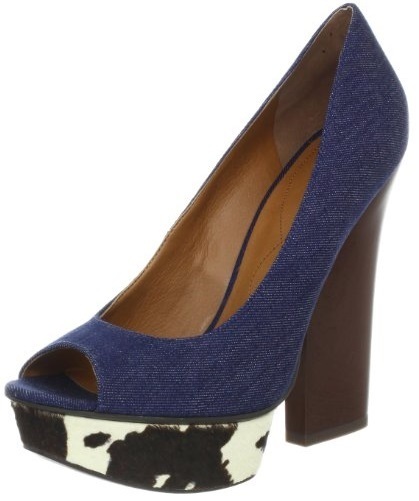 NINE WEST WOMEN'S HAIRY OPEN PUMP from Amazon Fashion. $119. Sizes 5-12. I love how subtle the print on the shoe is. Adds just the right amount of pop. STEVE MADDEN TAILOR FLAT from Barefoot Tess. $49. Sizes 11-14. The neutral tone of this snake print allows you to wear it will many outfits. 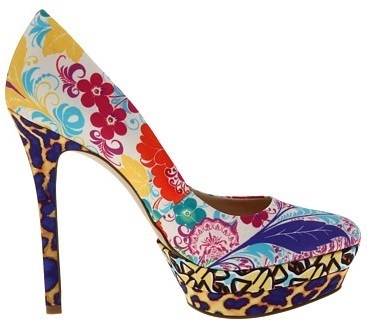 NINE WEST KASH from Zappos. $69. Sizes 5-12. Ships free. The gold tips combined with the gold print make this shoe a show stopper. AMERICAN EAGLE JENERR SIDE BOW WEDGE from Payless. $19.99. Sizes 5-13. This black and white print hits two trends for spring and summer. NINE WEST SPROUT from Zappos. $99. Sizes 5-12. Ships free. All of the bold colors in this print with make everyone take notice. LONG TALL SALLY SPOT PRINT BOW BALLERINA from Long Talll Sally. $65. Sizes 10,12 and 13. The details on this shoe make it delicious. I love the contrast between the polka dots and the color blocked bow. DV BY DOLCE VITA TREMOR WEDGE from Barefoot Tess. $79. Sizes 11-13. 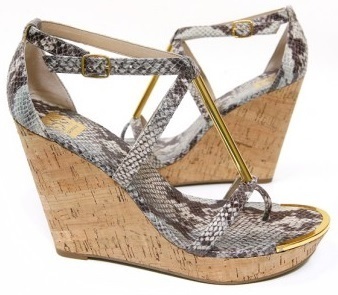 The gold accents of this wedge make the snake print stand out even more. A great combination. NINE WEST DIG from Nine West. $99. Sizes 5-12. This tribal print wedge is also sporting the Pantone color of the year, green. BP MANSON FLAT from Nordstrom. $69.95. Sizes 4-13. The edge of the studs and military print will ramp up a casual outfit quite nicely. SADE from Elevenup Shoes. $59. Sizes 11 and 12. Floral will be everywhere this spring and summer. These add just the right amount of the print.